Hello! Buezzy here, and it's nice to be back in the writing circuit. I'm mainly this site's PPV results guy, but sadly, I can't do TV show results on a daily basis. (Boo, work.) To make up for it, I'm taking over the weekly wrestling recap every Sunday. Here are 10 of the highlights in pro wrestling from the last week of September. It's bloody, kinda Braun-y, and—in the case of Part 1 of Ultima Lucha Tres—barbaric. We start off with an injury that showed once again why Cesaro is one tough S.O.B. In the middle of the RAW Tag Team Championship match between The Hardys and Sheamus/Cesaro at No Mercy, the Swiss Superman was sent to the ring post—and BAM!—he emerged with a bloody mouth. At first, everybody thought he lost his two front teeth, but WWE later reported that it just got buried in his gums after the impact. Damn! 9. Too Sweet to coexist? The Young Bucks got a memo from million-bucks juggernaut WWE for their use of the "Too Sweet" hand gesture. This happened when the Bullet Club filmed a skit outside RAW in Ontario, CA on Monday. Petty? Not exactly. In last week's Grapevine, we point out that the WWE owns the intellectual property for the hand sign. The Undisputed Era's undisputed leader, Adam Cole, finally made his NXT debut on Wednesday (U.S. time). With cohorts Bobby Fish and Kyle O'Reilly in tow, Cole defeated SAnitY leader Eric Young with a Shining Wizard. Also on NXT, Kassius Ohno beat ex-cruiserweight Fabian Aichner, Lars Sullivan defeated Oney Lorcan in what Jocs Boncodin in his Smark Hen-XT review called "just two gnarly men going at it," and Heavy Machinery continued to make an impact. Braun lost to Brock after an anticlimactic F5. Then on RAW, with Lesnar not around as usual, Strowman was once again in floating status. He was spoiling for a fight, which one-half of the RAW Tag Team Champions, Dean Ambrose answered... and failed to win. Next week, it's the turn of Dean's partner, Seth Rollins, to challenge the Monster Among Men. Also on RAW, Finn Bálor's feud with Bray Wyatt—whom he has defeated in two consecutive PPVs—looked to be far from over. Mickie James rekindled her feud against RAW Women's Champion Alexa Bliss. And Jeff Hardy takes a break due to a shoulder injury. After weeks of rude Superstar impersonations, one Roode has had enough. At SmackDown Live, Dolph Ziggler was confronted by the "Glorious One" Bobby Roode, who challenged him to a match at Hell in a Cell. Also on Tuesday, the feud between Kevin Owens and Shane McMahon escalated. In the main event, Owens brutalized Sami Zayn on the ring apron once again. This prompted a Shane O'Mac appearance, but KO pushed a staggering Sami toward a charging Shane, then skidoodled out of the arena, avoiding contact before their Hell in a Cell encounter inside the hellacious structure. We also learned that The New Day chose to defend their SmackDown Tag Team Championships against The Usos inside Hell in a Cell! But it's another RKO outta nowhere that takes the cake. Randy Orton disrupted a celebration in honor of Rusev, which also involved a singing Aiden English and the mayor of Rusev's Bulgarian hometown. It was entertaining as hell; take it from our resident SmackDown Live reviewer #NitPickRick. Meanwhile, Charlotte sent SmackDown Women's Champion Natalya a message at Carmella's expense, WWE Champion Jinder Mahal continued his schtick, and Tye Dillinger seemed to be left out of the U.S. Title scenario after weeks of being in it. Lucha Underground's four-part Ultima Lucha Tres kicked off Wednesday (U.S. time) with a cold-blooded three-round Hell of War Match between Killshot and Dante Fox. Round 1 was a First Blood Match, followed by a No DQ Match, and finally a "Medical Evac Truck" (a.k.a. Ambulance) Match. 2. Mike. India. Zulu. Tango. Oscar. Uniform. Romeo. Alpha. Golf. Echo. Whew, that's too long of a hook for an entrance theme. After No Mercy—where an unborn child's father retained his Intercontinental Title against the RAW GM's son Jason Jordan, and where Roman Reigns speared John Cena into an apparent hiatus—The Miz and Reigns's paths crossed on RAW. Reigns guested on MizTV to begin the show, then later finished off Miz in a non-title match. But after the bout, Bo Dallas and Curtis Axel initiated a Miztourage beatdown. When they were done, the trio banged their fists in unison, atop a battered Roman. Looks familiar. "Is this it? Will we finally have a complete Shield reunion?!" asked Nicole Le Saux on her RAW Report. Though she also noted how WWE continues to insist on making Reigns a babyface. This week's biggest story: The Realest Guy in the Room gets real. 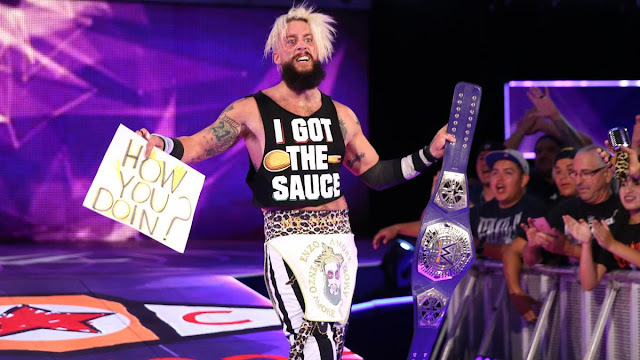 Enzo Amore's backstage heat took centerstage, and the trigger was pulled at No Mercy when he low-blowed Neville to win the Cruiserweight Championship. Enzo gloated about his undeserved victory on RAW the next night and felt Neville's—and the entire Cruiserweight Division's—wrath as a consequence. Then at 205 Live, he went on full-blast and got his crutch-assisted revenge on Neville. But as Romeo Moran said in his Live from the 205 review, "It's important that they don't overstay his welcome." For those who's still annoyed by all this, let this post-RAW beatdown of Enzo (featuring Braun Strowman) be a source of relief. TNA/Impact Wrestling/GFW may have fallen far from its #2 spot, but it doesn't mean it lost its spot in wrestling entirely. Apparently, it's their Victory Road special. Eli Drake retains the Global Championship against Johnny Impact, thanks to shenanigans and Chris Adonis. We have new tag champions after Ohio Versus Everything defeated L.A.X. EC3 and James Storm are now in an unholy alliance. There was a huge six-women tag, while Trevor Lee remains the X Division champ. Michael Bueza (@mikebueza) is a researcher for Rappler.com, a Managing Editor of Smark Henry, and a huge trivia geek. A post-Attitude Era wrestling fan, he caught up with what he had missed by literally reading through all WWE (and some WCW) pay-per-view results on the Internet. He posts PPV results for the site, and has recently taken over Smark Henry's weekly wrestling recap.